In our modern industrialized society, we have altered the relationship between our circadian (daily) body clock and the day-night cycle. In many cases we are active long into the night and sleep during the day. In extreme situations, such as shift-workers and trans-meridian air travelers (e.g. jet-lag), overriding circadian rhythms can be more than just a nuisance, and lead to health problems. These problems can include metabolic syndrome, increased risk of heart disease, higher incidences of certain types of cancer, disrupted immune responses, and increased risk of suffering from depression or anxiety. We focus on the relationship between circadian rhythms, sleep, and mental and physical health. 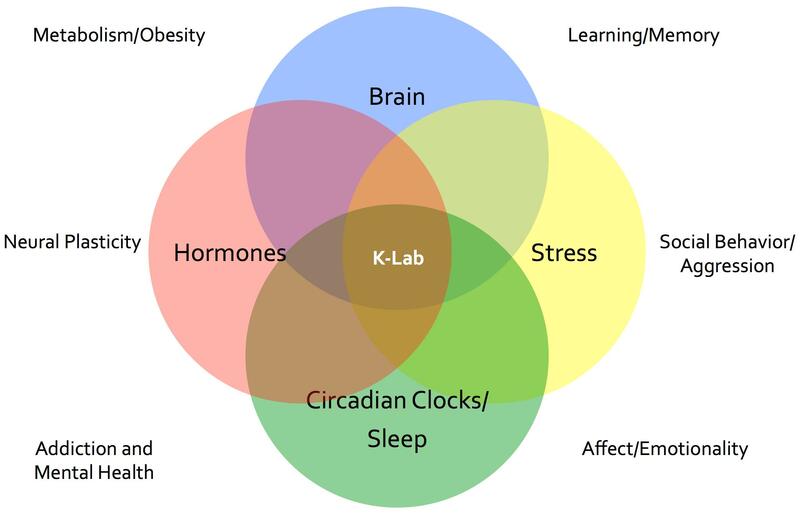 We are particularly interested in how disruption of the circadian clock leads to negative health outcomes by making individuals less resilient to other challenges in the environment, like stress, immune challenge, and changes in diet. It is hoped these models will provide an understanding of how dysregulation of the body’s timing interact to produce changes in behavior and physiology, and will potentially lead to new clinical interventions to alleviate some of the physical and mental health consequences of our modern lifestyles.